The UCLA Section of Pediatric Dentistry began the process of transforming its postdoctoral pediatric dentistry training programs in 2006, with a goal of preparing pediatric dentists to more effectively meet the substantial and growing oral health needs of underserved children within the context of individual children, families and communities. As health care evolves, it is evident that we must prepare new pediatric and general dentists to embrace working “across disciplines” using the key interprofessional principles of collaboration, cooperation, and communication, in order to better serve patients. ​This is particularly important in meeting the needs of underserved and high-needs populations. Following the Children’s Oral Health Framework three dimensional model of children, families and communities, we aim to develop and implement a multi-pronged approach to training our residents to meet the needs of the communities they will serve. ​Established in 1960, the UCLA School of Dentistry is a nationally recognized center of excellence in dental education, research and patient care. The Doctor of Dental Surgery (DDS) program emphasizes comprehensive diagnosis and treatment, and prepares approximately 100 graduates annually -- including a group of internationally trained dentists seeking additional training in the US. The School also sponsors 12 dental residency programs, including three residency programs in pediatric dentistry and two residency programs in general dentistry. ​Since 1970, the UCLA Section of Pediatric Dentistry has been dedicated to improving pediatric oral health by educating residents, students and health care practitioners on the physical and mental growth and development of children; and the practice and science of pediatric dentistry. The Section offers three advanced education programs in pediatric dentistry: one based at the UCLA Center for the Health Sciences in Westwood ( CHAT HSC); a community-based program which has its primary clinical training site in the Venice section of West Los Angeles (Venice CHAT-PD); and a new community-based program in collaboration with the San Ysidro Health Center, a federally qualified health center. Five residents are admitted annually to the HSC program, 2 to the Venice CHAT-PD program, and 3 to the San Diego CHAT-PD program, for a total of 10 Pediatric Dentistry residents per year. The UCLA Section of Pediatric Dentistry began the process of transforming its postdoctoral pediatric dentistry training programs in 2006, with a goal of preparing pediatric dentists to more effectively meet the substantial and growing oral health needs of underserved children within the context of individual children, families and communities. Two new multidisciplinary, community-based Community Health and Advocacy Training in Pediatric Dentistry (CHAT-PD) residency programs were initiated in Los Angeles (2006) and San Diego (2008) with HRSA Title VII, Section 747 support. These programs differ from prior traditional programs in that they provide clinical experience predominantly in community clinics serving high-risk and underserved populations and contain a community health and advocacy training (CHAT) curriculum component modeled after an innovative UCLA program for primary care pediatric residents. 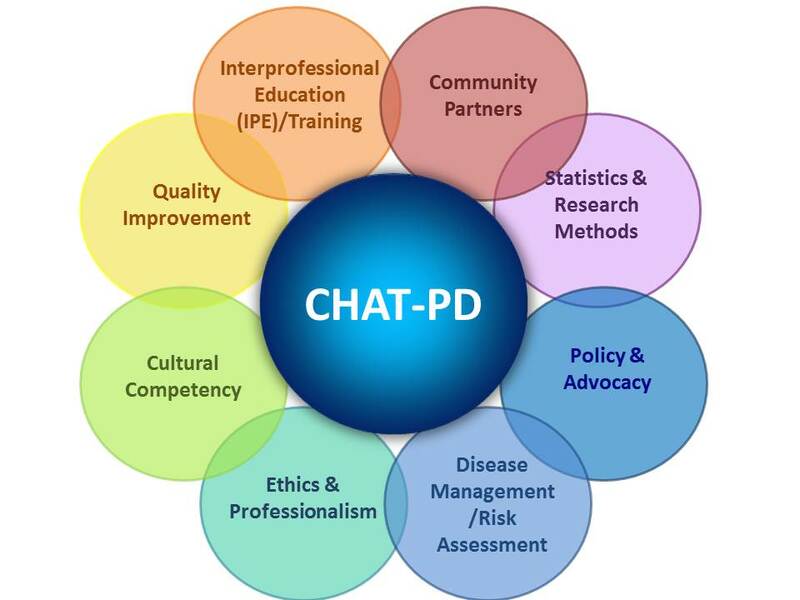 While a strong clinical program has been established for these programs, CHAT-PD requires additional efforts and resources to fully develop, formalize, integrate and implement new curricular elements into the current curriculum; to recruit, develop and retain CHAT-PD faculty expertise; and to develop and implement sustainable distance learning technologies across all UCLA Pediatric Dentistry residency programs. The fully accredited UCLA Venice CHAT-PD program, initiated in July 2006, has a strategic mission to both prepare pediatric dentists to better support the substantial and growing oral health needs of underserved children in diverse communities, and to serve as an exemplary model of academic program involvement in community systems and advocacy efforts to improve children’s oral health. The program is designed to provide inter-disciplinary training in collaboration with an innovative UCLA CHAT residency program. The principal clinical training site is the UCLA Venice Dental Center, a facility operated by the UCLA School of Dentistry in West Los Angeles, which provides care to a culturally diverse, predominantly low-income population. CHAT-PD residents also provide clinical services at the UCLA HSC Children’s Dental Center and at the nearby Venice Family Clinic (VFC), a multi-site UCLA-affiliated federally qualified health center. The fully accredited, older, and larger of the two Los Angeles-based UCLA pediatric dentistry residency programs, has produced over 200 residents since its inception and provides a rich didactic and clinical experience in traditional aspects of pediatric dental practice, with exceptional experiences in treating children under I.V. general anesthesia (provided by dental anesthesiologists) in our dental clinic, in addition to orthodontics and participation in craniofacial team activities. Residents treat a diverse patient base that includes underserved low-income, racially/ethnically diverse and special needs children.